SquidProxies Review & Rating 2019 - Why 4.4 Stars? Squidproxies is a dedicated proxies providers provide both HTTP/HTTPS private proxies and shared proxies, Datacenter locate in USA, Europe, Asia and Australia, Offer 7-Days money-back guarantee and Note Only Support IP authentication. Proxies have become one of the most crucial assets in many online based businesses. For their versatile features, many people consider buying private proxies. But most of the newcomers in this area face problems in choosing the right proxy service for them from a pool of many available options. We set out on a mission to help you choose from these various options and make the right choice while buying. Today, we will introduce you to Squidproxies, which has been around for a pretty long time and has garnered very positive feedback from the users. With more than seven years of service, Squidproxies is surely one of the most experienced proxy services currently in operation. With their vast experience, they have already placed themselves in a respectable position. However, we wanted to try out the proxies ourselves and bought 10 private proxies to test. After a thorough testing process, we have found both positive and negative sides of the service which you can see below. Fast and automatic delivery of proxies after payment. IP based authentication, does not require username and password while setting up proxies in applications. Quick and responsive customer service. Vast network of proxy servers across four continents. Refresh of IP can be requested every month after payment of renewal. Up to 10 IPs can be authenticated. So, it can also work with dynamic IP. Payment via credit card is accepted through 2checkout. Does not offer special proxy packages for specific purposes. Does not let users choose proxy locations while purchasing and is only available through support ticket. No trial period and the lowest package for shared proxies is $24 USD. Unlike most other proxy services, Squidproxies does not offer a long range of packages for specific purposes, which can often make customers confused. Instead, Squidproxies offers only two different sets of proxy services – Shared Proxies and Private Proxies. While having special purpose proxies are convenient for business, and targeted marketing, the proxies offered by Squidproxies are all-purpose proxies, so most suitable for general users. Also, when a certain IP gets banned in a website, they cannot reuse it for another specific site and so if you’re assigned that IP, you won’t be able to visit the banned website. However, Squidproxies guarantees working proxies for all private packages and will give a refund if the purpose is not fulfilled. Squidproxies does not guarantee working shared proxies for special purposes. They also don’t allow refreshing of IPs in shared proxies and suggests buying private proxies for special purposes. Shared proxies also come at larger packages, the minimum being a package of 100 proxies. Another negative side of shared proxies are, they have fewer locations and subnets compared to the similar private proxies. 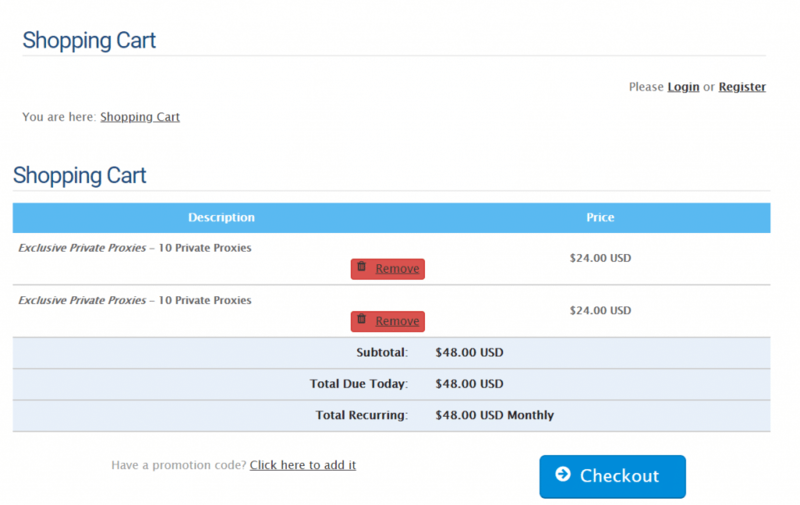 The lowest shared proxy package is at $100 for 100 proxies. Squidproxies has four different shared proxy package, the maximum being 1000 proxies for $650 USD. They also support custom packaging for 2000 to 5000 proxies, but for custom packaging, you’d have to contact support first so that they can understand why you need the proxies. Since Squidproxies specialises in private datacenter proxies, they have several versatile packages for private proxies. The smallest package is of 10 proxies, priced at $24. The maximum available package that can be bought on their website directly is 2000 proxies at $1500 USD. If you are new to buying proxies, you might be disappointed to know that Squidproxies does not offer test proxies for you to try before actually buying them. This is done to prevent misuse. However, you can buy the lowest package, and if the proxies don’t suit your purpose, you can claim a refund. Squidproxies has a 7-day refund policy and will try to sort out the problems you’re facing with the proxies and will refund you in case they fail. Squidproxies has one of the most diverse proxy server locations. With datacenters in USA, Europe, Asia and Australia, Squidproxies is almost all over the world. Although they don’t reveal much about their servers, they provide an interactive digital map on their website where you can see all their server locations. Squidproxies has a vast network of proxy servers across the USA and Europe to meet the demand of the customers. Apart from the USA, Squidproxies has servers in Australia, China, India, United Kingdom, Switzerland, Sweden, Estonia, Romania and Israel. 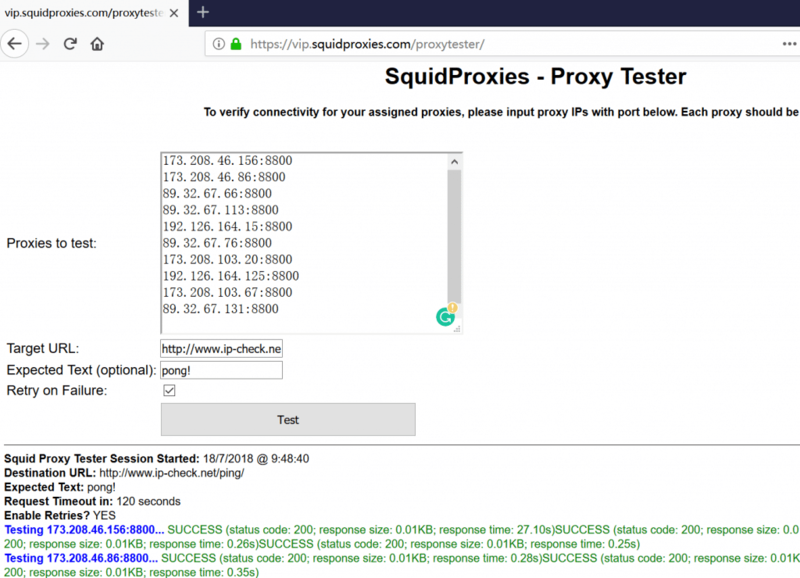 We purchased 10 private proxies from Squidproxies to perform our tests. We used whoer.net to check the ping of the proxies in different locations. The result is not particularly mind-blowing, and we’d expect Squidproxies would work on improving their ping since this is a crucial criterion for buying proxies. Squidproxies does not let you know the server location of the proxies that you are given. Neither do they let you choose the proxy locations while you are buying the proxies. They have mentioned on the website that the package SPP-10 (10 private proxies) has two cities locations and after verifying the proxies through iplocation.net, we found this to be true. Here is ours IPs test, you can check ISP of Squidproxies’ Proxy servers. Squidproxies does not offer new proxy IPs every month by default, but you can ask for refreshing your proxies after the payment of renewal is complete every month. However, please note that they do not refresh proxies for shared proxies. All private proxy packages of Squidproxies come with unlimited bandwidth facility. But the shared proxies are shared across multiple users and due to usage of other users, the network may seem somewhat sluggish. This should not have effect on total bandwidth. The proxies are distributed automatically within five minutes of payment via paypal. So there’s no delay after the registration process is complete and the proxies can be used with no further delay. The proxy IPs are distributed automatically after the payment is complete so there’s no delay after the registration process is complete and the proxy IPs can be applied instantly using the given username and password. Squidproxies has a generous seven-days refund policy. Since they do not offer a trial period before buying proxies, customers often hesitate before investing. The 7-days refund policy will come in handy to many customers who need to check whether their proxies are a good suit for the need. To keep the users happy, one of the most crucial things is to fix as soon as an issue arises. Squidproxies has focus on this and has built a very good customer support. They reply to all support tickets within 24 hours of filing and are very helpful as well. Squidproxies has a very detailed knowledgebase so that new users can easily understand how to use their service. The knowledgebase also contains answers to some very frequently asked questions so that as a potential customer can know everything you need to know without knocking them. Squidproxies offers some tools for the convenience of the users. A downloadable software provided by them is the Proxy Manager, from which you can manage the proxies as well as authenticate the proxies. There’s an online proxy tester available as well. This tool lets you check whether the proxies are working properly. The website of Squidproxies is very organized and a potential customer won’t be deterred after visiting the site. You can easily find the Private/Shared proxy details from the top navigation menu and can buy the desired package right away. Another great thing about Squidproxies is that they accept credit card payment along with Paypal and Bitcoin. During the registration process, you won’t be able to select desired countries or cities. But after your payment is complete, you can file a ticket stating the required location and they will reply you within 24 hours. Unlike many other proxy services, Squidproxies does not offer username and password based authentication and instead offers an IP based authentication system. This is somewhat easier than username based authentication and requires one less step. On their knowledgebase, Squidproxies has detailed tutorial articles on how to install and use their proxies. After buying the proxies, you will be given a list of proxies and ports as well as a username and password. 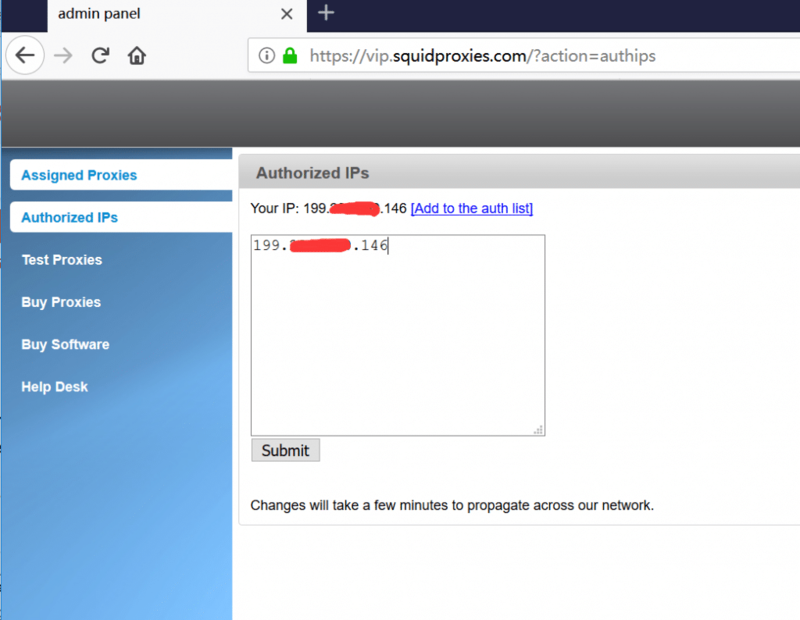 Since Squidproxies uses IP based authentication, you’ll need to authorize your IP first. To do this, simply log in to https://vip.squidproxies.com/ and enter the given username and password. From there, click on IP authorization and add your present IP address. Now, you’ll need to add the proxy IP to your web browser or other applications. As proxies can be configured for each application individually, the exact process might be different for each application. However, most of the cases, the option to add proxy settings can be found in the settings panel by searching or usually under the Network panel. Due to IP based authentication system, the proxies don’t require password verification. If you want to use the same proxy IP for all application, it’s a good practice to configure the system proxy configuration. You can also configure proxy in smartphones. However, they still do not support individual configuration of proxies for each application. Instead a system proxy needs to be added from the settings panel. This can be done on Android or iOS devices by going to WiFi or WLAN from Settings app and then clicking on the connected WiFi. The option of entering the proxy IP and Port address can be found by scrolling down from there. Since the proxies offered by Squidproxies are authenticated based on IP address and not password, you need to add your mobile internet’s IP address to the authorized IP list. Being one of the earlier proxy services, Squidproxies knows how to best serve their customers. We liked their service due to their simplicity and straightforward business policy. They do have some scopes to improve and we expect they’ll bring those changes soon enough. Their positive user feedback in forums is already enviable to many other services. We’d recommend the Squidproxies to the new proxy users. As a new user, you will love their support and the ease of use.